Langtang Valley Trek trail is in inside the Langtang national park, the fourth national park in Nepal and was established in 1976 as the first Himalayan national park. Langtang valley trek is offers an opportunity to climbs the Kyanjin Ri (4773m) and Tserkori (4984m) to discover the best panorama views and glaciers. Langtang is a region in the Himalayas of Nepal to the north of Kathmandu Valley and bordering Tibet, it is rated in third most popular trekking destination among the other Nepal’s Himalayan region. This is a perfect natural trail offers you the breathtaking scenery of Langtang, untouched secret valley, perfect wilderness and cultural experience, varieties of wild flowers and wildlife. 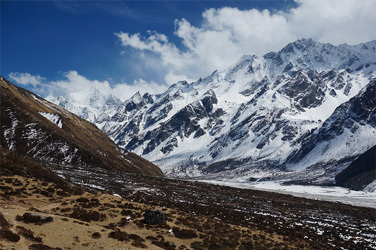 The Langtang valley trek is starts from Syabru Besi and end at Syabrubesi, it takes about 8 hours driving from Kathmandu. From Syabru besi we will follow the Langtang River to the east until we get to Kyanjin Gompa (3,870). Heading up a gentle slope, we pass along the dramatic ridges through local villages inhabited by Tibetans, Tamang and Sherpa people. While on trekking in Langtang valley, you can see the great views of Langtang Lirung, Langshisa, Ganja la peak and other snow-capped peaks. Beside mountains scenery you can see the variety of trees such as oak, maple, pine, rhododendron and bamboo as well as you can see the animals like Yaks, Himalayan black bear, the goat-like Himalayan tahr, rhesus monkeys and red pandas. During the trek in Langtang region, we are not getting fancy hotels and teahouses so we should be prefer to sleep and eat in basic trekker’s lodges/tea house managed by local people. Join our Langtang valley trek in our fixed departure dates or book private trek - go when you want individually, with friends and family. Today early in the morning we catch the public bus to Kathmandu or if you have booked private vehicle through our company then private vehicle (Jeep/Land cruiser or bus depend on group size) will pick up from Syabru Besi then drive to Kathmandu. It takes about 7/8 hours drive through scenic foothills and ridgeline vistas to Kathmandu.